The Astrakhan branch of the Azerbaijani Youth Organization of Russia (AYOR) was honored with diplomas of the City Major`s Office and Duma. 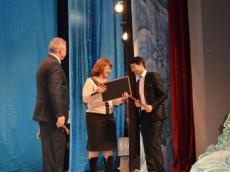 The organization was awarded for its active participation in the events organized by Astrakhan Oblast and City. Astrakhan mayor Mikhail Stolyarov and Chairman of Council of Municipal formation Elena Simeonova presented diplomas to chairman of the regional office of AYOR Elvin Huseynov. AYOR`s regional branch takes the first place among the oblast`s youth organizations for the third time.